I just drank a bottle of Minute Maid Pulpy. They say it’s got ‘no preservatives added’. Aw, c’mon…It’s bottled juice. Is that even possible? So I thought maybe... I should give it a try for myself since there's no harm in trying. Right? I didn’t believe it the first time I heard it’s got no preservatives added. So I read the ingredients (even the fine print) and everything checked out! It really has NO PRESERVATIVES ADDED! That means it doesn’t have ingredients that may turn out to be allergens, or worse...carcinogens! Whew! Now that’s healthy goodness that tastes so good, I... want to have some more! Minute Maid Pulpy is perfect for parties, school, work and even late nights. So okay, it’s got no preservatives added. That’s really good, right? Not just because it doesn’t have those icky, harmful ingredients, but it also means... having a ready-to-drink juice that helps the body maintain healthy tissues and a strong immune system. So far anyone who still has a hard time believing that Minute Maid has got no preservatives added - meaning it's THAT natural, it's almost like it's plucked straight from the tree, it's just as Mother Nature wanted your orange juice to be, it's got nothing but the good stuff yes, none of those potentially toxic stuff that can harm your brain, kidneys, heart; cause tumors aargh- the list of preservatives' bad effects just go on!!! Anyway, just to prove a point on just how good Minute Maid Pulpy is 'cause it's got NO PRESERVATIVES ADDED, I'm gonna make sure that Minute Maid Pulpy will be on my grocery list just to have a refreshing drink and vitamin c filled in one. Thanks to Ms Janette Toral. I found out about this contest from her. 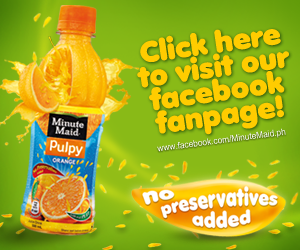 My dear bloggers, you can also join the Minute Maid Pulpy contest by visiting their fan page on Facebook and get a chance to win P20,000 by simply blogging!